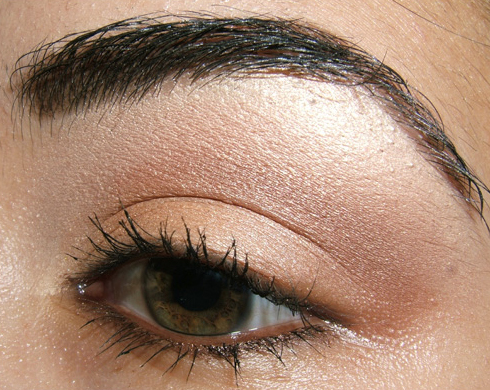 Super simple, super easy neutral eyes! 🙂 Really! I hardly used any product to get this look, so I really do mean it when I say simple! 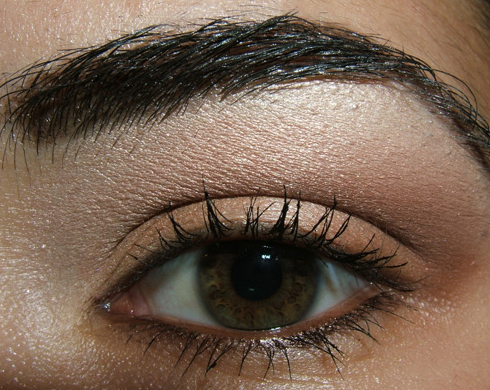 Directions: Define brows using a coordinating powder shadow applied with the 266 brush. Apply Soft Ochre paint pot all over the lid as the base with the 249. 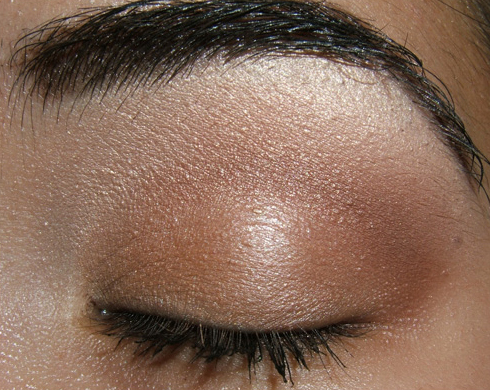 On the lid, apply Bamboo eyeshadow using the 239. 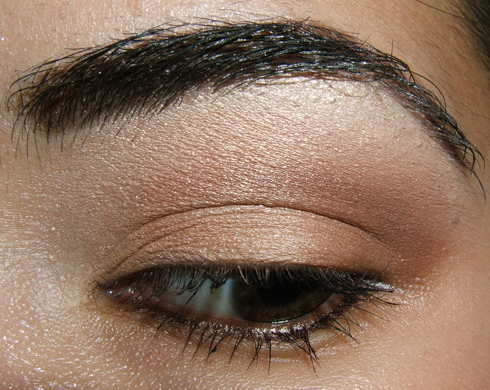 Darken crease with Texture eyeshadow using the 239. Sweep Shroom underneath the brow bone to highlight. Finish with Urban Decay Bourbon 24/7 Liner on lower lash line, and Plushlash mascara on lashes. 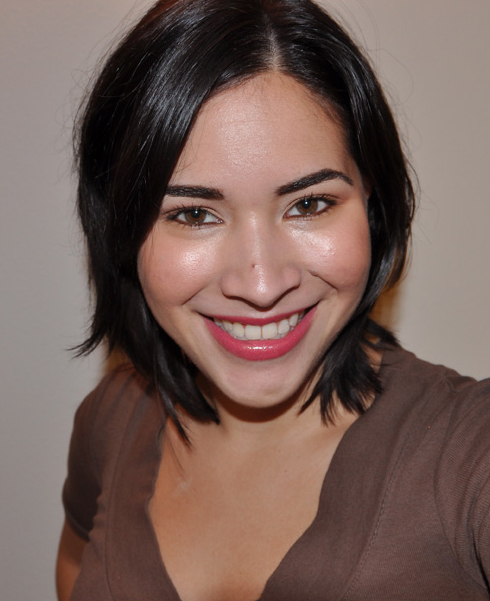 Sweep apples of cheeks with NARS Mata Hari blush using the 129. 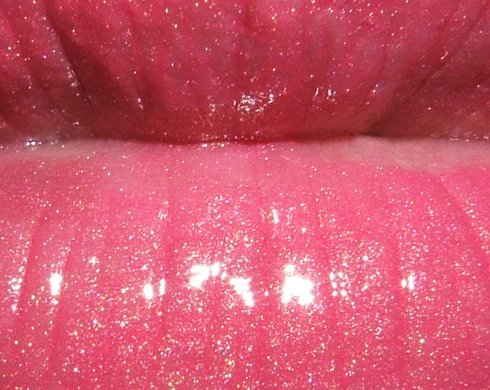 Apply Sweetie lipstick to lips, and then top with Red Devil lipglass for color and shine. You look lovely with this soft look. Very pretty and fresh! Very very pretty ! So soft and you look beautiful ! Oooh, this is soooo pretty. Your puppy is adorable. Have you ever put Peanut Butter in the Kong? My dog loves that! There’s a place near my house that sells dog toys made out of ballistic nylon (it’s bullet proof!). 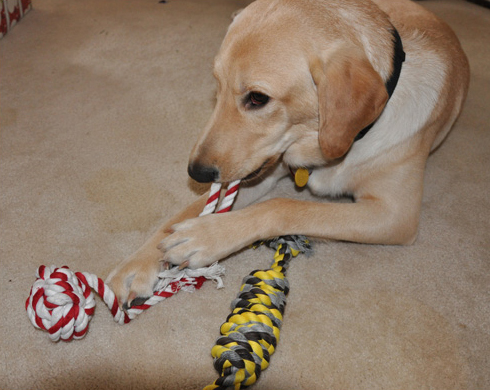 I can’t remember the brand at all, but they last really well for dogs who destroy their toys. Maybe you could find some for your dog? I will have to look into the ballistic nylon! Thanks for the tip! Thanks, Catherine 🙂 These are GREAT shadows to have! I like how you used a matching kind of lighter color eyeliner with this look. I tend to go dark and heavy on the eyeliner when my eyes are so light and neutral, so I’ll have to try doing this myself. Thanks for the look! You’ve totally convinced me that I need Red Devil. So I’m getting it when I go shopping next weekend. Along with a bunch of other stuff. 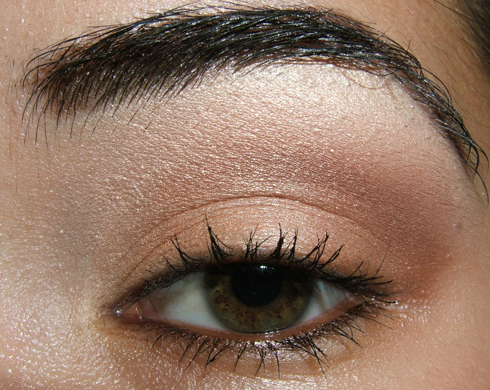 I’ve never really tried neutral eyeshadow before. I usually wear more colorful looks. But I’ve been wanting to buy a couple browns. Was thinking of Inter-view and some Starflash ones, maybe. It’s really pretty! I do like it, and I can never have too many coral glosses. I would love recs., for a neutral look for an NW43/Dark mineralize powder, I would love to recreate the look on my complexion, so far I have patina and shroom and Rubenesque paint pot. If you use a good base, you should be able to recreate this look no problem. Soft Ochre is really good, so I think if you had that, you’d be able to dupe this! Finally – a look that I have all the colors for!! I love it. It’s gorgeous. Hi, Christine. This looks sooo nice on you. Question: would this look still be similar if you used All that Glitters and Bronze instead of Bamboo and Texture? Also, you mentioned that part of the reason why you use so many colors in the looks that you post is because you have so many eyeshadows to choose from. After viewing photos of your collection, I TOTALLY understand. However, I wonder if you could (at least sometimes) post the paired-down versions of the looks that you post. For example, in a green-blue eye look where you use 5-6 colors, what would be the 3 most important ones (and where you would put them) to achieve a similar color look, albeit less professional looking (which I would be ok with for now, LOL). You can always ask me to pare down the essentials for you if you find a look you want to recreate 🙂 or you can even say, “I have ____”, would these work? As you did in this post. That way I can really do my best to recommend colors that will work with what you do have! I think this is one of your best best looks! Thanks, Brooke! Not yet, but you can expect them when the launch actually comes out! Very pretty! You really glow. Do you add shimmer/highlighter to your foundation? Looks very golden! Thanks, Karen! Nope, I don’t add any to my foundation, but I do often wear shimmer on my cheeks (whether from blush or a highlighter). When I saw the eye alone I didnt think I was going to like it, but my dear you look fabulous in this look! I went out and bought Soft Ochre after seeing this look. Then I went back to other looks and realized that this is THE MOST FREQUENT paint pot base that you use. YAY. 🙂 The MUA in MAC store said that it’s also very similar to Bare Canvas paint, which I also have. Is that true? By the way, in one of your previous posts, you said that you do not use moisturizer – just foundation. What about SPF? Do you just apply foundation on the bare skin? I love, love Soft Ochre! 🙂 I like it better than paints. I think they are a little similar, but the texture is different. I never got the hang of paints, but I adore Soft Ochre. Hm, what post was this? Maybe it was a really, really old one! I use moisturizer everyday, before I put on foundation, LOL. I know I’ve been doing this for at least a year, if not two or three. The foundation I generally use (MAC SFF) does have SPF15 in it! Paints are alright – I love the product inside, but I hate, Hate, HATE the packaging! As soon as I opened it, I had to be careful not to press on it at ALL or else loads of paint would come out! I had to hold it by the crimp… for application, I use my hand as a palette, and squeeze about a millimeter of cream onto the back on my hand. Not only do I apply it to my eyelids, but I also use it as a primer for my lower lash liner as well! Unfortunately, you have to REALLY pile it on there to see the gorgeous golden shimmer. Unroll the very bottom of the tube 🙂 It’ll help with that problem! favorite look of all!! i swear i soooo love this!